From "Keep It Affordable" to "Keeping It Affluent"
The only thing wrong with the upcoming 2019 K900 is the badge. For years, Kia was known as the automaker that made cheap transportation. The car company started out making cars that got poor quality and reliability ratings, but it’s taken major steps to reduce that. Now, it competes with the best in the industry. The same story can be said for all of the Hyundai Motor Group. In the most recent J.D. Power and Associates Initial Quality Study, Genesis, Kia, and Hyundai took the top three spots in that order. With its quality so high and fantastic new cars like the Stinger sports sedan, we wonder if it isn’t time for Kia to have its own premium brand. If the Stinger hadn’t happened, it would be hard to make the case for a Kia premium brand. The Cadenza and K900 are fantastic and upscale cars that offer much more than their competitors for the money, but they don’t demand the kind of attention the Stinger does. Both the Cadenza and K900 are luxurious sedans with plenty of power, a long list of standard features, and excellent technology. They’re pretty good to drive, too. 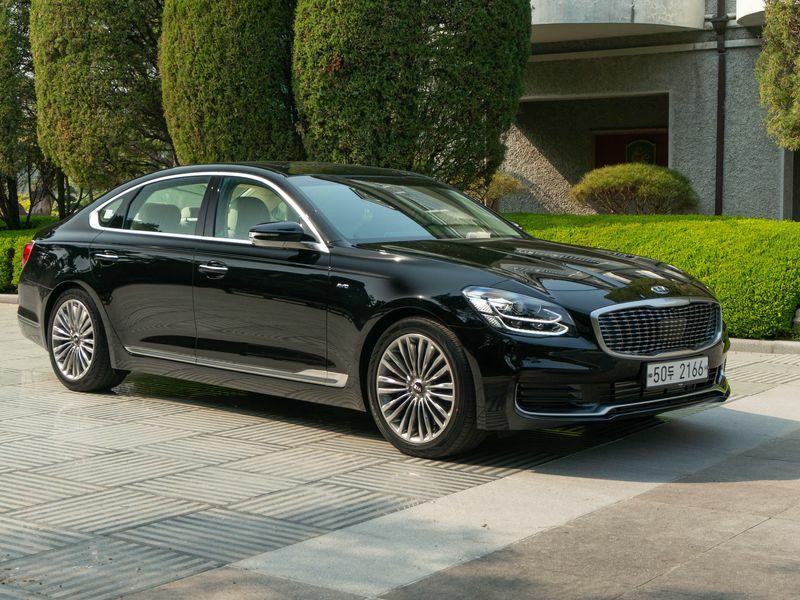 The K900’s driving characteristics lean heavily on the side of comfort over sportiness, and the Cadenza walks a respectable line while still erring on the side of comfort. We found the Kia Cadenza to be a fantastic and upscale car when we reviewed it. The biggest problem with these cars is that they’re price tags are too high for cars with Kia badges. The 2017 K900 (the 2018 model isn’t on sale yet) starts at about $50,000. With options, you’re looking at a $60,000 Kia. Ouch. The Cadenza is a lot better, with a starting price a little over $32,000. That’s still dangerously close to the price of a base BMW 3-Series, and we could see a lot of people making that jump. Then we come to the Stinger. With a very reasonable price tag of about $32,000, the sports sedan is a steal, but opt for the top trim level, and you’re looking at an almost $50,000 car. Add in the few options and accessories offered, and you’re looking at a price of about $54,000. Still good, but not the bargain it seemed at $32,000. The K900 is essentially a luxurious lounge on wheels. We found it quite comfortable in our review. These prices aren’t unwarranted. Kia builds some of the best cars in the industry. Despite this, there are still a lot of people out there that won’t buy a car with a Kia badge on it at any price. If these three cars, in particular, had a premium brand backing them, we bet the company would sell a whole lot more of them. Kia could play the value card, like Genesis is doing, offer something a little different than its cousin brand, and come away with some respectable sales numbers. Genesis is taking it to the premium competition with a lineup of sleek, luxurious, and well-built cars. Hyundai’s luxury arm, Genesis, is undoubtedly a strong force in the luxury car world. Big players like Lexus, Infiniti, Cadillac, and even some of the German brands like BMW and Audi, should be a little worried. Some people won’t ever buy a Genesis because they want a Mercedes-Benz or BMW, but there’s real value to be had in the Genesis brand. Kia could do the same thing, but with more of an elegant approach. Genesis has had a somewhat rocky start from a brand and dealer network standpoint. First off, the Genesis name came from a former Hyundai model. For some people not in the know when it comes to cars, this shift caused mild confusion. Hyundai has cleared most of that up with quality marketing and advertising. Second, dealers aren’t exactly happy with the way Hyundai chose to roll out the brand. Genesis will now have its own, unique dealerships for its vehicles. Dealers were told they could continue to sell the luxury cars at their existing Hyundai dealerships, but later on, Hyundai decided to distance its luxury brand from the Hyundai brand. This meant separate, select dealers. Many dealers already spent money for their showrooms to showcase the Genesis vehicles, but after the shift to standalone dealerships, they were told they would not be able to use that space for Genesis cars. If Kia were able to learn from the mistakes made in the rollout of the Genesis brand, it could do essentially the same thing that brand has done, but without the headache of angering many of the valuable dealerships around the country. With Genesis operating at a select number of dealerships around the country to keep its exclusivity, Kia could try a different kind of rollout where its cars are more widely available. We could see premium Kia brand getting the same or similar awards and accolades as Genesis. This could transition to more of a cohesive and celebrated brand launch internally, which could translate to more sales overall. Kia has not expressed interest in a standalone luxury brand, but with the right planning and product, we think it could be a serious success.